I've flirted with the idea of becoming a Certified Fly Caster many times. It really wouldn't do anything for me professionally. I guess I just want to confirm I do know what I'm doing. After watching this video I know for sure I couldn't pass it. At least not with my casting skills currently. The video has some great info but the part I found the most beneficial goes over tailing loops. I get tailing loops from time to time. I can usually correct them on the spot and I've always wondered what exactly causes them. This movie explains it really well. FFF Casting Instructor, Casting Demonstration 1 from Silver Creek Outfitters on Vimeo. The Six Degrees of Blogs? I'm sure you've heard of the Six Degrees of Kevin Bacon. It's based on a theory of Six Degrees of Separation, "the idea that everyone is six or fewer steps away, by way of introduction, from any other person in the world, so that a chain of "a friend of a friend" statements can be made to connect any two people in a maximum of six steps. It was originally set out by Frigyes Karinthy and popularized by a play written by John Guare." This phenomenon also happens in the fly fishing blogosphere. Take my most recent experience. I talk with Emily Block the writer for the blog Mysteries Internal from time to time. I was looking for suggestions on artists who specialize in fishing. She recommended Becca Schlaff. I contacted Becca and asked if she had a design my TU Chapter could use for T-Shirts. 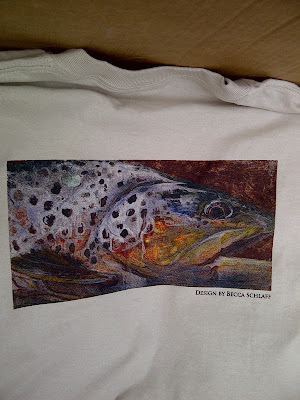 She generously offered a brown trout design. 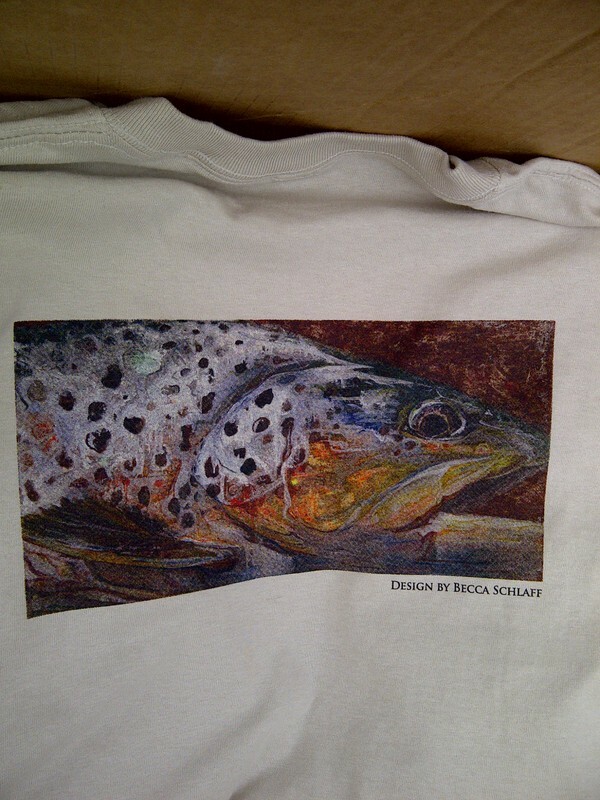 I recently got the shirts done and posted a picture of the shirts on Becca's facebook page. While looking into fly tying tips I ran across a website called Fly Anglers Online. The website had various tying information and a whole section on tips. There were quite a few I had never seen before. One was about separating bucktail. Apparently if you take a razor and go straight down the dark section at the back of the tail it will separate the colors. 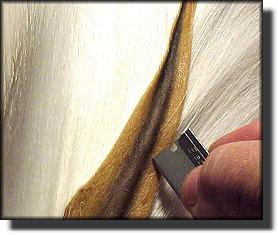 This will give your buck tails a lot longer life. No more having to fight the hairs for a specific color as they thin out. 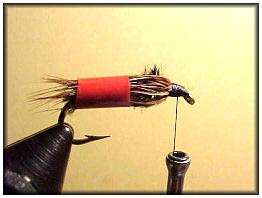 When I tie softhackles I always have an issue of trying to wrap while keeping the hackle fibers out of the way. The site showed an easy remedy for this. Just use a straw. I can't believe I had never thought of this before. You can find straws in various sizes at most fast food places. With all the fancy pricey tying tools out there it's nice to have cheap and simple alternative. Another one of my favorite tips deals with chenille. The material usually always comes on a piece of cardboard. It's easy to deal with but it can unravel fairly quickly. The answer is a pill bottle or 35mm film case. I joined a fly swap started by Trevor the writer for the blog Fly Carpin. At first I was stoked at the chance too get hooked up with some awesome carp flies. Then as the list of who was participating grew the reality started to set in. I was hit with the fact that I myself had to tie flies too. The list of who would get them is a little intimidating. Some of these guys are professional fly tiers and I'd hate for them to think I sent them trash. My first idea for a pattern that was fairly easy to tie evolved into something a lot more difficult. I tried to think of a fly I'd like to have. In the end I came up with this. The thing I mainly like about this fly is the coloring. It's a cross between a dragon fly nymph and a crawfish. I'm not really one for naming flies but if I was going to I'd go with Damcraw. The dubbing I used for this fly is something I got from Stu Thompson. Stu is a guide that mainly fishes big waters in Canada. He has a DVD and various pictures of him with monster catfish and carp. He has a cult following on the site Warmfly.com. The crawfish color dubbing he sent me is the best I have ever seen. I have never had great luck with crawfish patterns. I decided to try tying some using the dubbing and pheasant feathers. I noticed the bottom feathers on a pheasant tail work as mock pincers. Tell me what you think. It never ceases to amaze me how fly fishermen and fisherwomen help one another. I did a post a few weeks ago about fly fishing apps. In my search I couldn't find anything recent but I did find some applications that were fairly old. Some didn't work with later versions of Windows. I was contacted by Bob Burdett and avid fly fisherman who just so happens to dabble in programming. 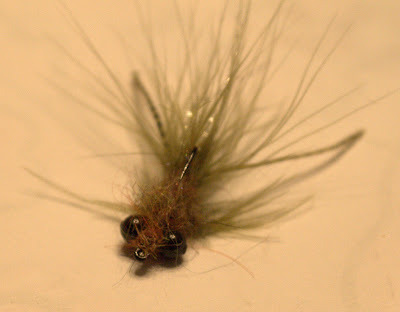 He has created a database with tons of fly tying patterns and regular fly fishing info in general. Bob offered a copy of the program and like so many other fly fishing experiences when I offered to pay him for at least the CD, shipping or endorsement this was his response. Mailed the package today and you should have it towards the end of the week. Appreciate your offer for distributing my "inventions" but everything I do in regards to fly fishing is gratis. If I can make the world a slightly better place by creating something then it becomes slightly better." Bob and I also shared various fishing tales and information about fishing our local waters. I was really tickled that he was kind enough to contact me and hook me up with what obviously took a lot of time and effort to create. Bob's program is called The Lost Creek Fly Database. You can see by the picture the database has a lot more than just fly patterns. The fly patterns archive is very extensive. If you select the fly you'll be taken to a specified screen. Here you'll see the materials needed to tie the fly and step by step instructions on how to tie it. The coolest thing is you can add your own creations to the database. I can see me using this for years to come. OK here's the part where I pay it forward. You saw Bob's email about doing this gratis. I asked him if minded me sharing his creation. He said he was fine with it but if someone wanted a copy of the program to contact him directly. I told him he might get bombarded with requests. This was his response. "I am glad you like it. Review it and blog away ... if I was worried about being bombarded I would not have responded on your site. If someone can use it, I always smile." Bob you asked for it. If anyone would like a copy of this awesome program please contact Bob by clicking here. I tried to meet up with the writer of The Rivah Blog yesterday. We didn't fish togother but what he found was pretty interesting. Check out his blog to read the rest. When it comes to fishing I guess I'm a little conceited. I'd like to think I know what I'm doing most of the time. I guess that's why I've never hired a guide. About a month ago I fished with a friend who guides on a delayed harvest stream. We both came up to a stretch where fish were rising consistently. Lance and I were both catching fish and I thought I was hot stuff for a little while. That was until Lance started doing something I don't know if I've ever seen another fisherman do before. Now I could write this like Lance was showing off and being an arrogant jerk. He couldn't be farther from that type of person. He spent a good hour of his fishing time helping a new fisherman catch his first trout on the fly. Lance didn't have to do this and you could tell his assistance was genuine. It wasn't like he kept throwing in plugs for his guide service while he was helping. So here we are on the water both catching fish consistently when all of a sudden Lance starts calling his fish. There was a fish right in between us and he said it had followed his fly on his last two casts. "Watch I'm going to get this one on the dry this time" he said. hehe sure whatever. I mean we all say stuff like that while fishing. Then I look over and actually see the fish take the dry. This fish couldn't have been more in the middle of Lance and I. It was probably 10ft away from each of us. I thought hmm that was really lucky. Then a few casts later Lance says "See that brookie over there? I've been watching it, I'm going to catch it on the dropper." Literally his next cast he hooks the fish on the dropper and brings it in. Wow, lucky twice. Well then he did this similar thing 3 more times. It's one thing to make a comment or bring it up but to say I'm going to catch a fish this way then do it on the next cast is pretty damn amazing. Lance did this repeatedly at least 5 times. I wasn't going to dare try calling my fish. I knew what would happen if I did that. I thought about doing it a lot. I didn't have the courage. I was more amazed at what I was witnessing. It made me realize the separation between guides and regular fisherman. I mean Lance knew his bugs and fish behavior down to the point where he could predict it. I'd love to get to that level. In the end Lance was as humble as always. Telling people he caught a few when they asked. When in truth if he did try he probably would have lost count. He offered to let me use the fly he was having luck with but I was having some success and felt I had caught enough fish already. I've never really been one of those how many fish did you catch guys? I do have to admit I get big fish envy. I really don't mind someone catching 100 fish if I catch one that could eat most of theirs. Lance has a great blog and guides in NC. He is a pleasure to fish and have a beer with. 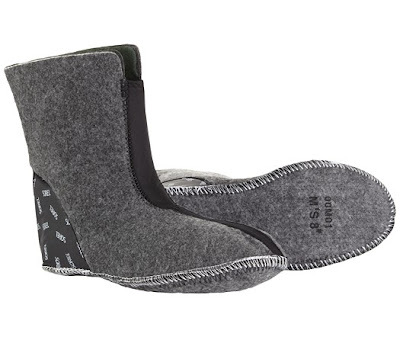 My most recent fishing trip lead me to start researching ways to keep my feet warm. I had to get out of the water and walk around on this last trip because my feet were freezing. I had on a pair of thick wool socks but they couldn't seem to withstand the chill of the cold water. The water was maybe 40 degrees. I was wondering what people in colder conditions do. I tried googling "keeping feet warm while wading." There wasn't an exact answer. There were more similar answers and from those I think I've devised a plan. There are a lot of choices out there. Liners and socks made out of various materials. 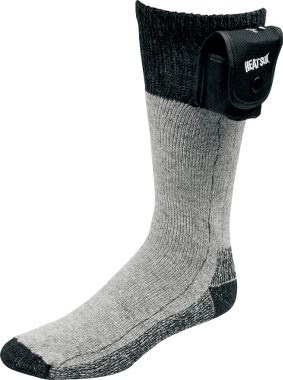 There's even electric socks that have a low voltage charge that warms your feet. From the information I've gathered it seems there are 3 things you want to keep your feet warm. Constriction to blood flow is the enemy. Keeping circulation is key. There's a common misconception that the more socks you wear the warmer your feet will be. This tends to cramp your foot cutting off circulation. Your feet will get colder and it can create a dangerous situation. I thought about going with a thicker liner that I'd wear inside my neoprene booties. Something like this. The problem is accumulating things around your feet while keeping room. I could buy another pair of boots and have a winter pair and a summer pair. That doesn't make much sense to me. Winter is short around here. I could look at it like an investment. I'm really not leaning this way. The option that seemed made the most sense was to wear a thin liner then wool socks over that. I will most likely go that route first then if that doesn't work I'll think about more heavy duty options. 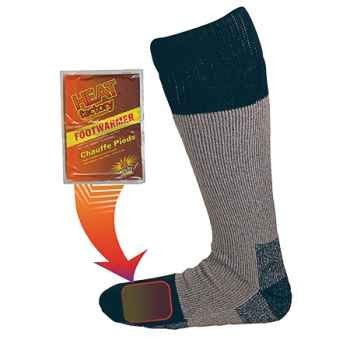 There's always those socks that have a pocket that holds foot warmers. 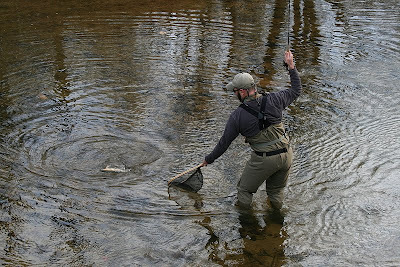 This time of year if you're fishing a delayed harvest stream you're mostly fishing for hold overs. Fish that have survived an onslaught of fishing pressure. Many of the fish have been caught at least once and they've seen plenty of flies. They get to where they only feed when there is a natural hatch going on or they just can't stand it anymore and have to eat. 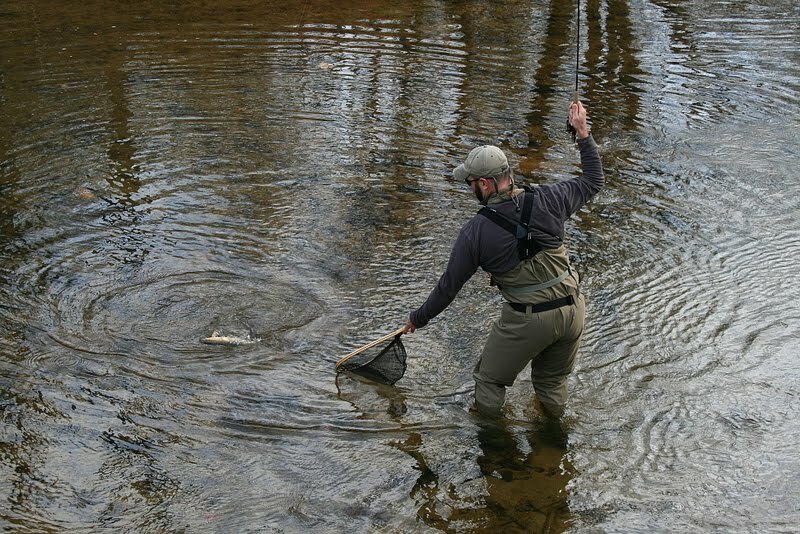 The weather conditions and pressure cause the fish to move around the river finding different lies. The fishing is harder and the fish aren't as easy to spot. They learn to hide in the faster current and blend in with the bottom. Over the years I have learned tips for fishing these conditions. Skip the shallow water and sandy bottoms. Fish have learned most of the food comes from rocky bottoms and sandy shallow water does not provide much cover. Pools usually 2-3ft deep right after large rocks are prime spots. Fish usually hide right under the main run of water that falls into the pool. When the water is really cold. High 30's, Low 40's. Fish won't move much. They want the fly right in front of their face and near the bottom. Good luck getting a fish to move much or come up near the surface unless there's a bunch of stuff hatching. A snag is a fish. Because the fish aren't moving much their hits are subtle. The only sign a fish is hooked is a silver flash in the water or a throbbing bend in the rod. Fish won't fight long. A minute max. I think the fish know there isn't a ton of food to make up for the lost energy. They give up quick. I have probably tied 30-40 flies recently. All of them nymphs. 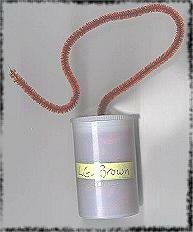 They are in various colors, natural, pink, red, black and green. I tried quite a few today and the only one that worked was a fly I bought. 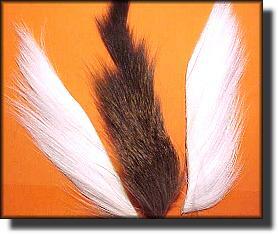 It was a bead head pheasant tail gold ribbed hares ear. I'm wondering if fish only hit other colors when the water is warm. In the 55 degree and above range. It seems anything colder than 50 degrees makes the fish prefer more natural colors. Brown and black. This theory would be good if the fish didn't hit Y2K's. Which are basically pink and yellow egg patterns. I tried some egg patterns today. I got fish to turn and even swipe at my fly but nothing would eat it. I'll need to experiment more. It was nice to get out and enjoy the day. I got my first fish of the year. A purdy bow. Before the holidays I was researching gifts for the family. The Kindle Fire intrigued me because of all of its functionality. I bought the Kindle Fire HD right after Thanksgiving and I have been really pleased with it so far. It has been a great eReader for my wife and there are a ton of free games and apps. Many of them are educational and great for kids. One of the main reasons I looked into the Kindle Fire was the option of watching movies over the device. The Fire HD has a 16GB hard drive and can play various movie formats. During the recent Christmas break I was researching tying patterns on YouTube and I kind of wished there was a way to have the movie right there next to the vise. I do have a laptop and I could put that near me but it takes up quite a bit of room. This is where the Kindle Fire HD really came in handy. I found a way to download YouTube movies and copy them to the Kindle Fire. This is great because I can now watch the movies with out being connected to the internet. I figured others out there might find this useful as well. Even if you don't have a Kindle Fire you can still use this info to download movies to your computer. The steps are super easy and there is no special software needed. Everything you require is free on the web. I'm providing these instructions for the sole purpose of helping with getting tying instructions. I do not condone pirating or stealing content that should be purchased from a vendor. Please make sure the content you are trying to download is not copyrighted. The first task was finding a way to get a YouTube or Vimeo movie into a format the Kindle could read. MP4 was preferred. I found this website called KeepVid.com. Find a YouTube or Vimeo movie you'd like to download. For this example I'm using this video. If you click on the video itself and go to the YouTube page the url for the video is at the top. It is also located under the video on the share tab. I have highlighted it in the graphic below. Copy the URL then past it in the download field on Keepvid.com. Similar to the image below. Click on the "Download" button. You will be presented with various download links and different formats. The format I downloaded was the MP4 format. Save the file to your computer. It's that easy. After the file is downloaded you can now watch it at any time from your computer whenever you want. To copy the movie to your Kindle Fire HD. With the Kindle on, connect the Kindle Fire to your computer using a USB cable. Your Kindle should have come with this. On your PC, open up a explorer view so you can see your drives. An example in the graphic below. If you're running Windows 7 you'll see the Kindle listed under your portable devices. Double click on the Kindle. You'll see the following screens after double clicking it. The folders on your Kindle will be listed. Open the Movies folder. Then open the location where you saved the video you downloaded. The last step is to copy the movie from your local computer to the Kindle Movies folder. After it is copied, disconnect the Kindle from your computer. Navigate to the apps menu. Choose the Personal Videos Icon, you can also download a free app like aVia. I used the Personal Videos app for this tutorial. If you don't see it under the Cloud menu check the Device menu. Inside the app you'll see all of your videos. Choose the video you want. I found this to be perfect for tying step by step next to the vise. The video is crisp and clear on the Kindle Fire HD. It's great to have the ability to pause or rewind the steps while you're tying. If you want to look something up you can pause the movie and use the Kindle Fire's WiFi to surf the web. It really is a cool little tool.